The new GDU375 is a large, seven inch portrait display that incorporates Garmin's latest technology to ensure outstanding readability day or night. The bezel that frames the sunlight readable screen has multiple keys on the bottom and right sides. The soft keys at the bottom of the display control the most commonly used features of the current page, such as turning the weather display on and off. The dedicated keys on the display's right side have specific functions such as nearest, direct to, flight plan, zoom in/out, and menu. Also on the display's right side is a rotary knob/joystick, similar to the G-1000, that lets pilots enter identifiers, pan the map, or scroll to page and sub-page groups. Although very similar to the portable GPSMAP-696, the GDU375 is designed for panel mounting, has redundant power inputs, expanded interface capability and front mounted SD card slots. 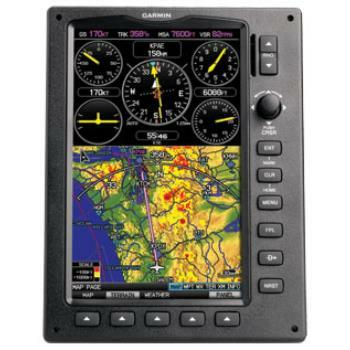 Garmin's FlightCharts can also be displayed on the GDU375 which brings electronic IFR chart capability to your cockpit. FlightCharts are pre-loaded and require a subscription purchase to stay current. 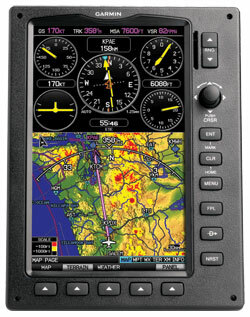 For those pilots that want all these features but either do not need XM capability, or fly where XM is not available, the GDU370 is the perfect solution. The GDU370 has all the same functions and features of the GDU375, but has no XM capability. Antenna options for GPS and/or XM are sold separately. Size: 7.83" x 6.04" x 3.41"